A truly gorgeous book. The Lighthouse Keeper’s Daughter totally lived up to my expectations and more. Inspired by an extraordinary true story, it is described as a ‘sweeping and epic historical novel’ and has just been published with Harper Collins. Matilda Emmerson is a young girl about to embark on a journey that will change her life in ways she could never have dared to imagine. From the small coastal village of Ballycotton in East Cork, Matilda finds herself on the pier in Cobh, ready to set sail to New York. With a father in politics and a mother who expressed little love, Matilda’s childhood was a harsh environment to grow up in. The day she arrived home with some shocking news was all it took for her parents to pack her off in disgrace to a distant relative on Rhode Island. Matilda is frightened. She is happy to be away from her cold and distant mother, but what life awaits her when she arrives at her destination in America? On board the ship her chaperone is a gentle and kind lady. Mrs O’ Driscoll takes Matilda under her wing and gives her guidance. With Mrs O’ Driscoll’s help, Matilda settles into her adventure on the high seas with a little more optimism for her future. On arrival, Matilda is met by her relative, Harriet Flaherty. Harriet lives a very isolated and private existence as the lighthouse keeper in Newport on Rhode Island. Initially there is much hesitation between the two, as Harriet keeps very much to herself. Matilda, while very grateful for a roof over her head, finds herself curious about Harriet. Who is Harriet Flaherty? What has driven her to living such a cloistered existence? As time passes Matilda gets restless. Always a very busy person, sitting around with endless days ahead of her does not appeal. With Harriet’s permission she takes stock of items, accumulated over the years, in an old chest. Handed down from generations, it is something that Harriet has always taken care of. On perusing the documents, Matilda comes across a half-finished portrait. With her curiosity piqued Matilda sets out about finding out a little more of who the woman in the portrait is. The year is 1838 and Grace Darling lives off the coast of Northumberland with her family, as protectors of Longstone Lighthouse. For Grace this island, this lighthouse is her passion. With her father as the main lighthouse keeper, Grace has always been his companion as they carry out the daily and nightly routines that keep the lighthouse in shipshape and keep many a sail safe from the deathly rocks off the coast. Not for Grace, silk dresses and a husband, but rather the forces of nature and all it brings. Grace sees beauty in everyday items she finds drifted up on the beach, be it seashells or broken glass. Grace Darling sees the world very differently to many other young ladies of a similar age. Grace has the pleasure of meeting a local artist one day who visits the island, a Mr George Emmerson. Grace finds him a very charming and amiable character, who sees the world as she does. But Grace knows that she can never leave her first love, the lighthouse, so she puts any notions of George Emmerson to one side. A very dangerous storm was the catalyst that would change the direction of Grace Darling’s life. As the winds blew and the rain thrummed violently against the windows of the lighthouse, Grace and her family prayed that all at sea would be safe and survive these atrocious conditions. As dawn brought some light to the skies, Grace witnessed a sight that she would never ever forget. A ship was in serious trouble, having lost it’s battle with the hurricane conditions. Grace’s father was slow to head out to sea knowing full well the risks they would encounter but with Grace by his side, and with her bravery and stamina, they faced the most difficult rescue ever experienced by either. At the time it was unheard of for a woman to be involved in such a rescue. They did reach a number of survivors, eventually bringing them to safety but the memory of what they saw and experienced was forever etched in their memories. Grace Darling’s story is true. She became quite famous at the time and as Hazel Gaynor has highlighted, there was a clamour from folk wanting to meet this heroic young lady. In The Lighthouse Keeper’s Daughter Hazel Gaynor expertly weaves the stories of Matilda Emmerson from Ballycotton and Harriet Flaherty in Rhode Island with that of a truly inspiring young lady, Grace Darling. Although one hundred years apart their story is one of pure heartache and inspiration. On finishing this book I tweeted that it was ‘a stunningly beautiful, tragic yet gorgeous, devastatingly wonderful read’ and there are very few words I can add to that. 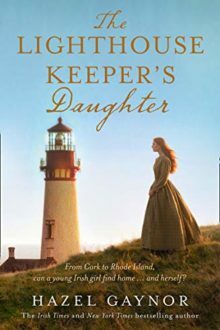 The Lighthouse Keeper’s Daughter is a novel about women and how inspiring strong women can really be. Matilda, Harriet and Grace were gutsy, courageous and brave. Their story, and the truly magnificent narrative that Hazel Gaynor made theirs, near broke my heart. Yes I most definitely recommend The Lighthouse Keeper’s Daughter, and of course the fact that Cork gets a mention is an added bonus (and that I’m an O’ Driscoll too! ).